I first came across baskets with wheels when I was pregnant with my youngest. They were a life saver, heavily pregnant and carrying shopping did not appeal too much. I know if I get a trolley for some reason I have to fill it regardless of what I need or how big the trolley is. Why is this? so a basket that acts like a trolley fantastic, I spend lots less. Now, however, baskets with wheels have a new purpose. Yes they still enable me to spend less, but they also keep a 2 year old entertained. My daughter loved it. Today was the first time she refused to sit in a trolley so I thought why not I will get a basket with wheels and see what she thinks. I only wanted a few things so it was ideal. 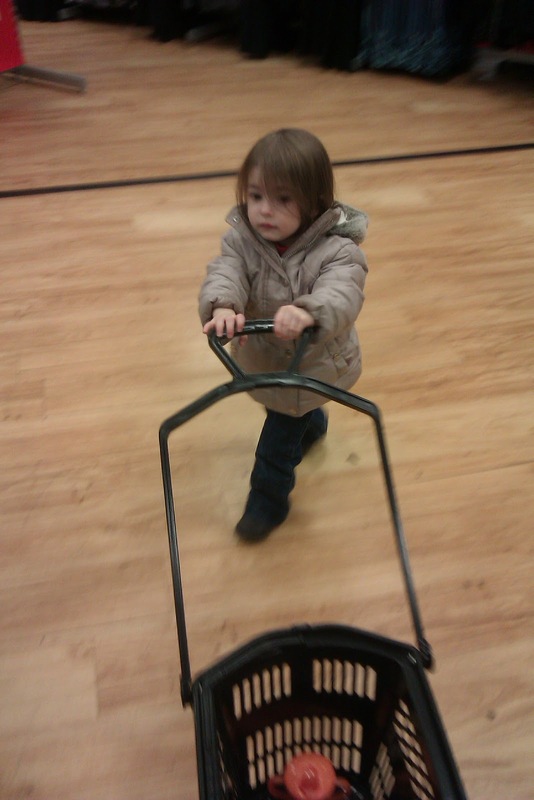 To her it was a trolley, she was pushing it round the aisles and filling it up. I had to keep distracting her to put things back, as at one point I had a basket full of toothbrushes, not sure why. She really enjoyed herself and was a little upset we had to return it at the end. This day I love Baskets with wheels. I love them too!! when i have the pushchair and have to nip in somewhere just for a few bits i can still steer my pushchair and pull my basket behind :-) Bonus! Brilliant. Sometimes it's the small things that get you through!